More accurately, how many #1 brain boosters with this almost exact formula can there be?? After all, NuClarity isn’t shelling out the most unique, most “premium” nootropic stack on the market. If anything, it’s fairly run-of-the-mill, stacking much of the same awesome nootropic ingredients you’ll find in other awesome nootropic stacks. And, yes, the ingredients are awesome — everything here makes nootropic sense, contributing to greater brain health and function. But is there a reason to buy NuClarity over its similar competitors? Is NuClarity really the #1 Focus, Energy, Memory Booster around? Let’s read the NuClarity review to find out. 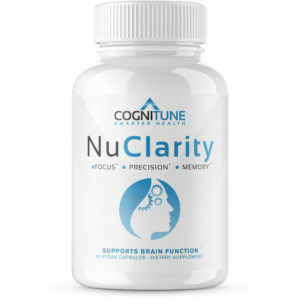 Cognitune NuClarity simply “Supports Brain Function,” as the label advertises, and it accomplishes this generally awesome goal with generally awesome nootropics. All natural nootropics here, each transparently displayed thanks to NuClarity’s rejection of the proprietary blend. Directions: Take one serving, two (2) capsules preferably with food or as directed by your healthcare professional. Once tolerance has been assessed, you may supplement an additional serving six (6) hours after your first serving. Bacopa Monnieri Extract (Std. to 20% Bacosides) – Memory, learning, high-order cognitive processes — Bacopa monnieri seems to assist with simply better academic thinking all around, improving the cognitive pathways that assist with remembering and processing new information. More on Bacopa Monnieri. Alpha-GPC 50% – As one of the higher concentrations of nootropic choline, alpha-GPC may improve neurotransmitter acetylcholine (ACh) activity. This brain chemical plays a key role in memory, learning, and neuromuscular function (the connection point between nervous and muscular tissues). More on Alpha-GPC. Better ACh will make you smarter whether you like it or not! N-Acetyl-L Carnitine HCL – This antioxidant amino acid seems to work by improving mitochondrial energy output, namely by increasing transport of fatty acid fuel to mitochondria for ATP energy production. More on ALCAR. Phosphatidylserine 20% – Your cells need membranes to keep all their goods internal. Phosphatidylserine helps to keep brain cell membranes structurally intact yet fluid enough to allow nutrients to pass in and out. Supplementing phosphatidylserine helps sustain memory and cognitive longevity. More on Phosphatidylserine. Ginkgo Biloba Leaf Extract (Std. to 24% Flavone Glycosides, 6% Lactones) – Often associated with elderly health, Ginkgo helps the young and old by increasing circulation across the brain and body, potentially improving working task-related memory as well. More on Ginkgo Biloba. Rhodiola Rosea Extract (Std. to 3% Salidrosides, 1% Rosavins) – Powerful, potent, fast-acting herbal adaptogen, Rhodiola helps regulate stress hormone cortisol release, reducing stress and fatigue for the over-worked and over-tired. I love this adaptogen. More on Rhodiola Rosea. Huperzine A – Sourced from Chinese clubmoss, this semi-synthetic compound helps sustain acetylcholine activity by inhibiting acetylcholinesterase, the enzyme responsible for acetylcholine breakdown. More on Huperzine A.
Here’s the thing(s) about NuClarity: all of the ingredients are awesome and make nootropic sense, everything in the formula contributes to better health and cognitive performance, and all ingredients are transparently showcased on the Supplement Facts label. What’s more: the ingredients all appear sufficiently dosed. Nothing stands out on this formula as exceptionally bad. Nor does anything stand out as exceptionally unique. If anything, NuClarity is the one of the best, most polished run-of-the-mill nootropic stacks I’ve seen in awhile. 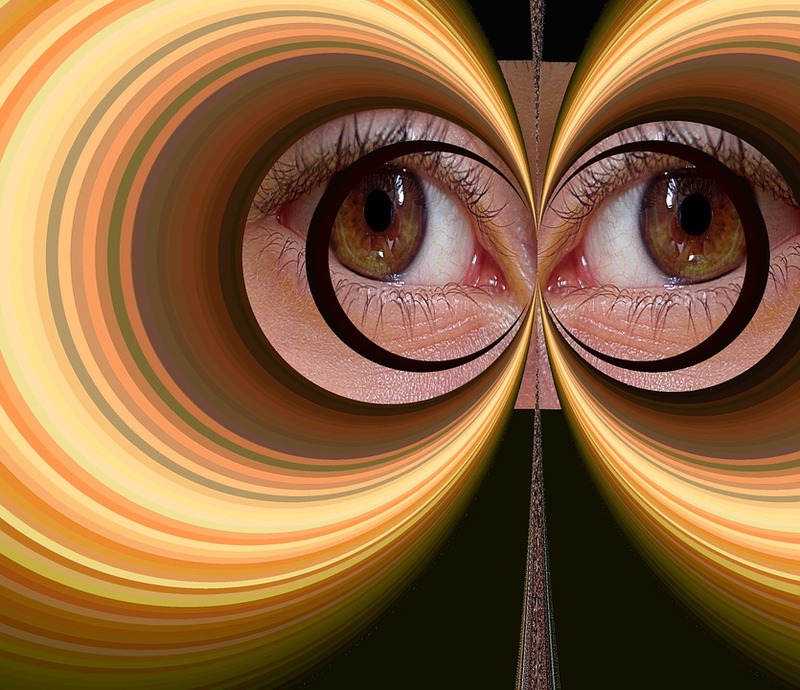 NuClarity supplies better cognitive clarity, albeit with a narrow focus on nootropics. 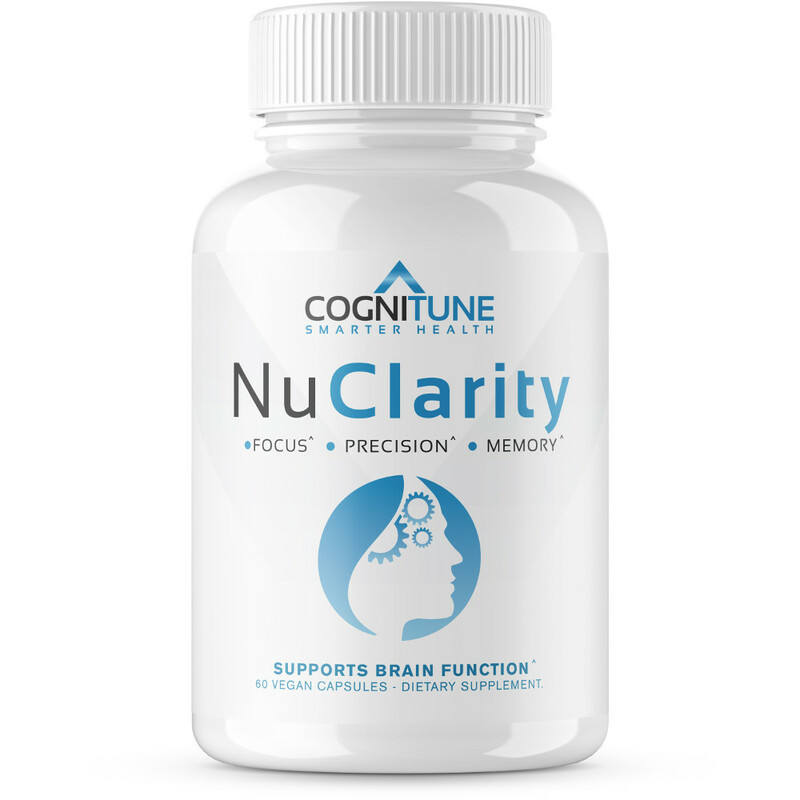 Memory, Mood, and Focus — and, yes, NuClarity accomplishes each of these cognitive benefits with its mix of cholinergic brain boosters and herbal adaptogen stress reducers. Having said that, it isn’t the most complete nootropic stack I’ve seen. This formula could be improved (or made more exceptional) with more dopaminergic acting nootropics (e.g., L-tyrosine) and other brain-life extending health compounds. However, for basic, daily cognitive improvement, NuClarity is a sure safe bet. NuClarity works. So, really, all you need to ask yourself is: how does NuClarity’s price compare to other similar nootropic supplements? (Especially considering how commonplace this stack is.) I’ll answer that one shortly. NuClarity sticks to nootropic ingredients that work, staying away from any unnecessary risks or nootropic newcomers for a more generally healthy brain health design. No proprietary blends or obscure ingredient listings. NuClarity transparently shows its ingredients. NuClarity’s ingredients are all pretty decent quality. No plain powders or hard-to-absorb compounds here. By avoid risky nootropics or nootropic newcomers, NuClarity fails to really stand out as a nootropic stack. Their best bet is to sell these supplements at a cheaper price that in its competitors. For the price, the ingredients are decent quality. However, this genuinely seems to be the case that investing a better, more expensive supplement would yield better quality nootropics than what NuClarity provides. 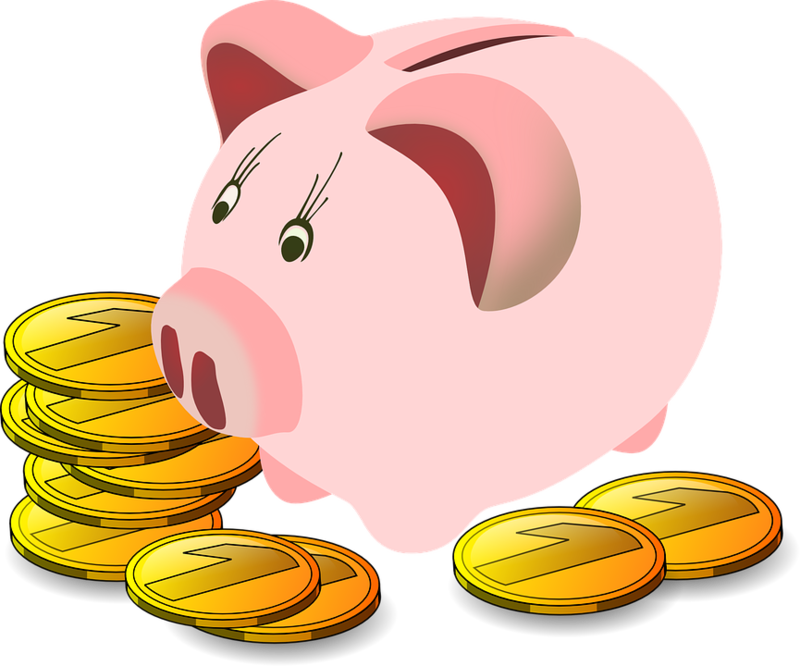 Don’t break the bank! NuClarity doesn’t actually cost that much. Okay, so… NuClarity doesn’t actually cost $89.91, nor is Nuclarity worth $89.91. This is the quote-unquote “Normal Price” listed on Cognitune’s website; yet, the manufacturer’s offer a discounted price of $29.97 when you go to buy the supplement on their site. And when you choose to order the product, it directs you to the Amazon listing anyways, which sells each bottle at a standard $29.97 — the actual price and a much more reasonable one at that. At the price you’re likely to buy this supplement at ($29.97), NuClarity’s price per serving reduces to $1.00. Nice. NuClarity appeals to a wide demographic, with exception to perhaps the more veteran nootropic enthusiasts. (And even so, the veteran nootropic types may enjoy this supplement as a base stack with which to supplement with other unique nootropic standalone ingredients.) This is a subtle nootropic supplement that doesn’t even supply the familiar caffeine rush often crammed into “brain health” stacks, so the stimulant junkies may need to look elsewhere for their brain boosts. You can buy NuClarity through Amazon. Even ordering the supplement through Cognitune’s website redirects you to the Amazon listing. Read my Best Nootropics on Amazon. With regards to the health claims advertised on the bottle: yes, NuClarity works. NuClarity isn’t a supplement that risks its neck (or effectiveness) on risky ingredients. They stick with what’s tried-and-true — and generally used by many other nootropic supplements — and supply these ingredients in decent quality forms and sufficient dosages. Really, that’s the bottom line with nootropic supplements, and it never fails to amaze me how many supplement manufacturers fail to meet this bottom line. For more diverse brain benefits, there are other Cognitune stacks to may accompany this brain health formula — e.g., NuBoost and NuRest. However, for other awesome nootropic brain health supplements, I recommend checking out my Best Nootropic Supplements of 2018 list.